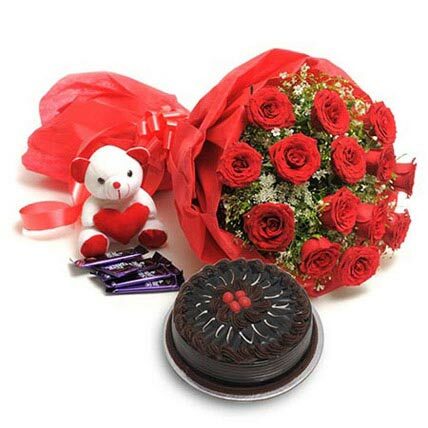 Combo consists of a 12 Red Roses Bunch, 1/2 kg fresh cream chocolate cake, 16 Ferrero Rocher. Great Value and fantastic gift. 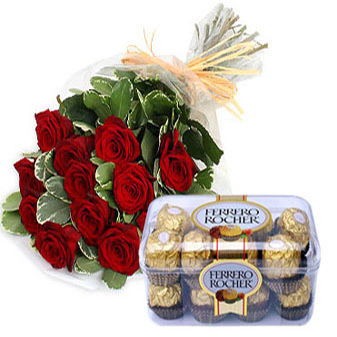 Send this birthday gift hamper with Ferrero Rocher chocolates, long stem red roses hand bouquet to family and friends on their birthday & special occasions. 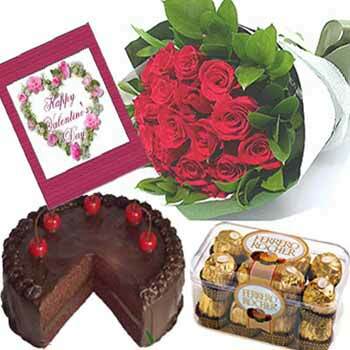 Special Mother\'s day Gift Hamper includes a bunch of red roses, fresh cream cake, ferro chocolates. 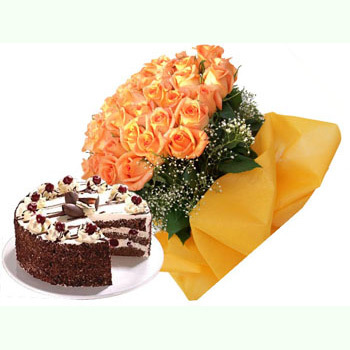 Send this gift to Mumbai and make your loved ones happy. 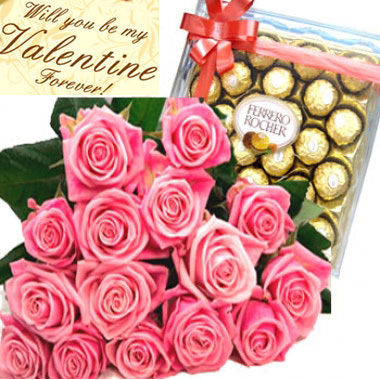 A perfect gift on the occasion Send this VALENTINE gift with 16pcs Ferraro Roche chocolate, long stem pink roses hand bouquet for your most loved one on this special occasion of valentine day which represents the celebration of love.Prompt Service!!!!! Orchids chosen from the best flower garden are given a lovely shape in tis bouquet by our creative florists. 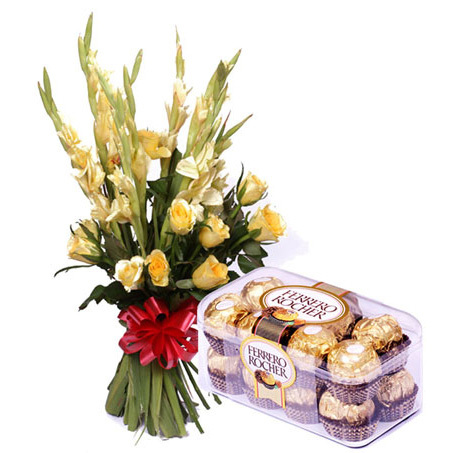 This bouquet is made special by adding a dash of ferrero rocher chocolates and therefore, sums up to be a perfect dose of gift for your loved ones on any special occaison. 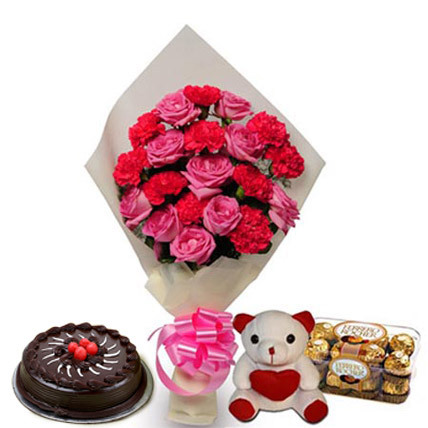 One sided bunch of 10 Pink Roses, 10 Pink Carnations wrapped in white color paper with pink ribbon bow, 500gm Truffle Cake, 6 inch teddy bear and 200gm ferrero rocher box. 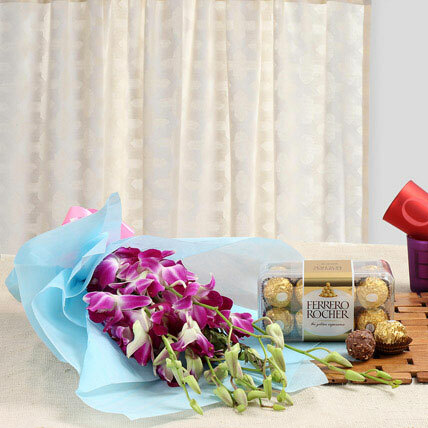 Here is a bunch of 6 purple Orchids beautifully packed in a pink paper wrapping with a matching bow for illuminating your special moments. 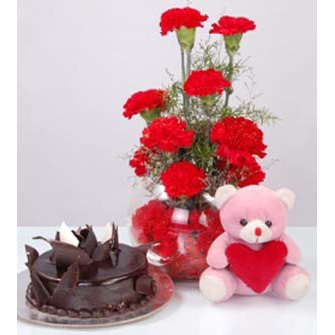 Combined with this is a delicious 500gm Blackforest cake and a cute 6 inch teddy. So why sit and wait, just order it right way and make your sweetheat happy!